Rangers Fans Waited Three Weeks for That? I have lived and died with the St. Louis Cardinals since I was seven years old. You know how it goes. It's surely the same way with your team. Once they get their hooks into you, they're a part of your daily life, forever. I don't remember the names of every one of my cousins or the names of every girl I ever kissed (their Venn diagram does not intersect, honest), but I know that Glenn Brummer inexplicably stole home to beat the Giants on August 22, 1982, and that Jose Jimenez's no-hitter on June 25, 1999, was saved by a diving play by Eric Davis that might have hastened the end of Davis's career. I can conjure up important moments in Cardinals' history more easily than I can conjure up important moments in my own. Everyone's kind of like that with their team. That's what makes this important. That's why all this matters. That's why we do it. I've got 30 years of Cardinals history vividly implanted on my brain ... and last night was the most amazing Cardinals game I've ever seen. I'm not gonna go through every detail of the Cardinals' staggering 10-9 quintuple comeback victory over the Texas Rangers last night to force a Game Seven of the World Series; you can get the play-by-play everywhere else on the Internet and besides, hopefully you saw it. If you didn't see it, if you weren't there, it can't possibly be explained to you. Even if you are wowed by the descriptions this morning, they can't possibly do it justice. The Cardinals were behind at five different points last night. They were down to their last strike twice. This is someone fighting back from a 40-love championship point at Wimbledon, and then not only coming back and winning, but also sprouting wings, breathing fire, and flying away. The statistical revolution in baseball over the last ten-some-odd years has turned words like "heart" and "guts" and "fortitude" into empty buzzwords, the sportswriter's and broadcaster's equivalent of corporate tech speak like "vertical integration" and "leveraging the platform." This has been a welcome development; no offense to David Eckstein, but baseball's more fun and better played when people understand why Mike Napoli is one of the best players in baseball even though he looks like a guy who hauls lumber. (Which I suppose he does.) But there is an inherent drama in the flow of a baseball season, getting to know a team's personality as if it were a person itself. I know that statistically this Cardinals team had a Pythagorean record of so-and-so and that the Win Probability was so-and-so; I know that narratives are provided by outsiders, and that an uncomfortably large percentage of everything that happens is due to luck and chance. But this Cardinals team is the most ridiculous one in my 30 years of being a fan. I was still watching games in mid-August, but man, I didn't want to. The Cardinals were losing, but it wasn't just that; they were losing in a particularly frustrating way, through an endless number of double plays (they set the National League record this year) and missed opportunities and lackadaisical play. So much had been invested in this season, by ownership, by the fans, but the team itself didn't seem to care. I heard several Cardinals fans, devoted Cardinals fans like me, say this was their least favorite Cardinals team in memory. The team had so much talent, and it seemed to actively choose not to use it. It was depressing to even think about the Cardinals. It felt like the end of something. And then the late August run came, and then the September sprint, but even then, it was so unlikely that they would come back that it was difficult to get emotionally invested; the Cardinals had made a couple faux -runs during the season, before August, before receding. There was little reason to think they wouldn't do that again. And even if they stayed hot ... they were too far back already. They'd missed their chance. And then they sneaked in, and then the Phillies and Chris Carpenter and the Brewers and David Freese and then last night, as vivid and memorable a night as the Cardinals have had in their history. For a month, this has been the most dramatic fan experience Cardinals fans have ever had; we have seen the platonic ideal of a Cardinals team, what we'd all been waiting for all along. It all happened so fast. It was impossible to imagine, and now, in retrospect, it seems inevitable. 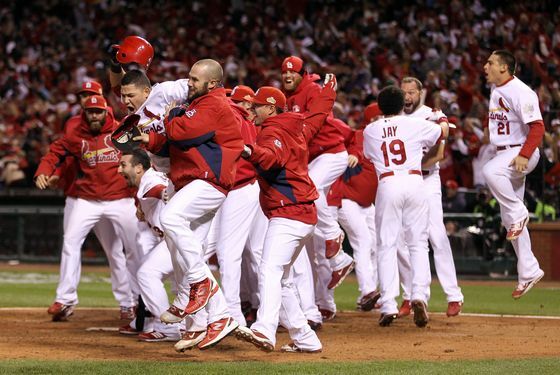 This Cardinals team will be the one none of us forget, no matter what happens tonight. Oh, yes, tonight. For the first time in nine years, the World Series is going to a deciding Game Seven. It'll be Chris Carpenter on three days rest for the Cardinals (with Edwin Jackson presumably ready to go in at the first sign of trouble) against Matt Harrison of the Rangers. I can't imagine how difficult last night was for Rangers fans. It might have been as difficult for Rangers fans as Game Six of the 1975 World Series, the Carlton Fisk game, was for Cincinnati Reds fans, but that didn't stop the Reds from coming out and winning Game Seven anyway. The World Series will end tonight. Game Seven is apocalyptic. It is too much. It is madness. And after this amazing season, and this amazing night, it is perfect and just and right.